COLUMBIA, Mo. 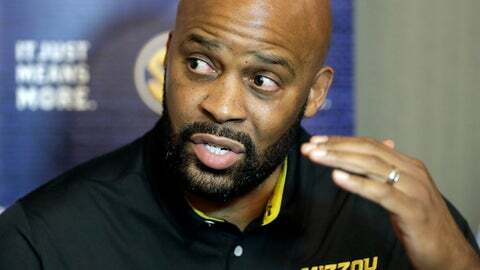 (AP) Cuonzo Martin took over a Missouri basketball team that had finished in last place in the Southeastern Conference for three straight seasons when he was hired in March. Any thought of a slow rebuild under Martin’s watch was ended when Porter – who was originally committed to play at Washington – announced he was returning home to Missouri in March after Huskies coach Lorenzo Romar was fired. The talented 6-foot-10 forward was followed by fellow freshmen Jeremiah Tilmon, Blake Harris, C.J. Roberts and his younger brother, Jontay, in signing with the Tigers. Suddenly a team that went 8-24 last season, bringing an end to the tenure of coach Kim Anderson, looked like one with a legitimate chance to make the NCAA Tournament. Leading the turnaround will be Martin, who left Cal after compiling a 62-39 record in three seasons. He has a $21 million, seven-year contract with Missouri . And he is close to home, having been raised two hours away in East St. Louis, Illinois. Little did he know at the time how quickly expectations would be raised for the Tigers, and that’s just fine with him and the Missouri upperclassmen who have suffered through the lean times over the last few years. The Tigers lost to Kansas 93-87 in an exhibition game last week, but they looked ready to contend in the SEC while competing against their former Big 12 Conference rival. Porter Jr. led the way with 21 points in 23 minutes in the loss, and he added eight rebounds. Missouri struggled mightily to both score and defend inside last season, but it enters this year with an overhauled frontcourt that features five players 6-foot-10 or taller. In addition to the Porter Jr., younger brother Jontay is 6-11. Also, Tilmon (6-10) brings size to a team that features returners Mitchell Smith (6-10) and Nikko Reed (6-10) up front. Former Canisius guard Kassius Robertson is expected to help improve Missouri’s outside shooting this season as a graduate transfer. Robertson made nearly three 3-pointers per game last season, and he averaged 41 percent on shots from behind the arc – a welcome addition for a team that was 332nd in the country last year while connecting on only 30.4 percent of its 3-pointers. With all the excitement surrounding the newcomers, Missouri does return its top three scorers from last season. Senior forward Jordan Barnett averaged 12.2 points per game, while Puryear was second at 11.8 and junior guard Terrence Phillips 10.4. The trio has welcomed the freshmen, even if it impacts their playing time. They are using their experience to teach the youngsters what they can about the physical play of the SEC. Missouri doesn’t waste any time testing itself to start the season, opening by hosting Iowa State on Nov. 10. The Tigers also face Power Five nonconference opponents Utah and Illinois before opening SEC play at South Carolina on Jan. 3.